Recently, as you may have noticed, I’ve been on a bit of a muffin kick. Or it could be a simple- one-bowl-cake kick. Or even a lighter baking (read: can be eaten with lesser guilt) kick. Either way, recent posts on this blog have been bakes which are variations and spin-offs of each other. Maybe because it has started to get pretty hot in Delhi already and creaming butter & sugar together till pale and fluffy is getting to be a pain. Maybe because I realised that I have “let myself go” more than a little and need to get a handle on things. Maybe because I’ve decided that 1 muffin + glass of milk is a filling and fairly balanced breakfast, with or without a side serving of fruit. Whatever be the reason, I’m in the muffin-zone. And no, there shall be no digs about muffin tops here. On a (very) slightly unrelated note, while I was buying veggies at the local Mother Dairy a few weeks ago, I noticed that the “real carrots” (read: desi, seasonal, actual winter carrots, as opposed to the bright orange, synthetic-y, tasteless variety we get in the summer) were phasing out. I had a moment of panic and bought almost 3 kilos of them. As you may have guessed, I went a bit nutty. 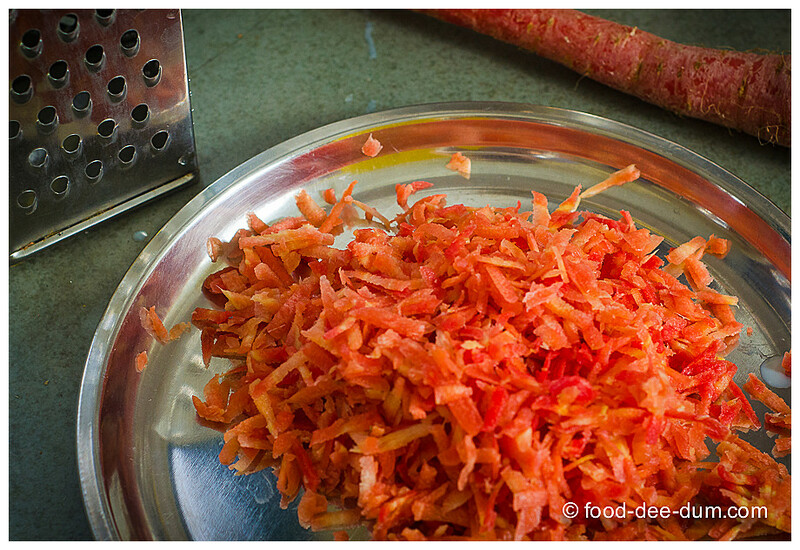 Carrots featured in every meal for 3 days – in salad, in soup, in sabzi or just by itself with some dip. 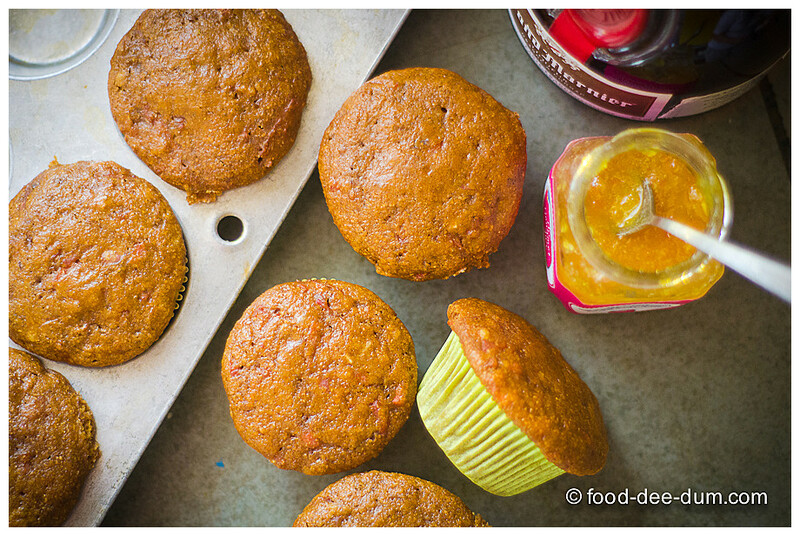 When I had exhausted all the other meal courses, I was left with the option of making gajar ka halwa or muffins. Clearly, the muffins won. Because they’re easy, take less time and are lighter on the tummy and the conscience. And I have been wolfing them down for breakfast these past few days. AK prefers them for dessert with some vanilla ice cream and a drizzle of maple syrup or honey. We’re getting a bit predictable in our food choices, aren’t we? 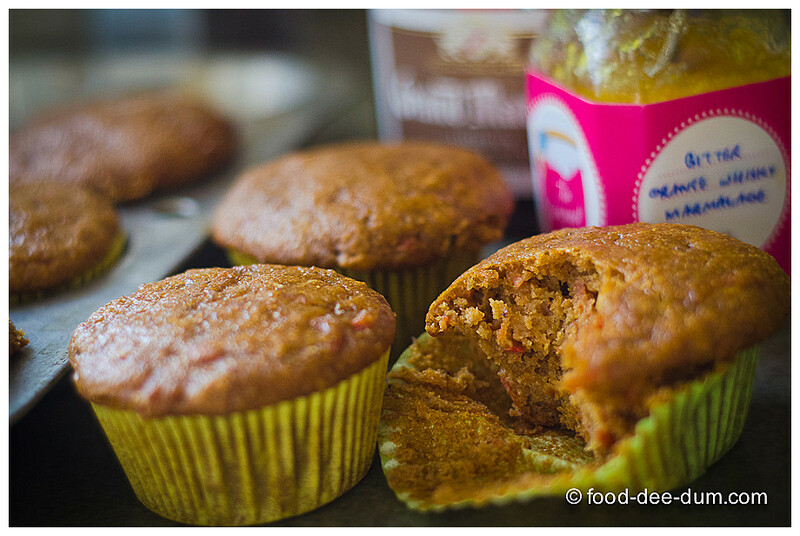 Trivia: the first and second muffins I ever made in my life were Raisin-Bran and Carrot Muffins respectively. At age 13, I thought they tasted “too healthy” and didn’t go back to making them for years. To me, it’s funny now that I made a muffin that was a combination of those two, and I actually loved them! Of course, this recipe has been adapted and modified over the years and bears no resemblance to the original (which was my nutritionist aunt’s 0% fat & sugar recipe). First, I turned on the oven to pre-heat at 180 C and placed the cupcake liners in the muffin tray, greasing them very lightly. 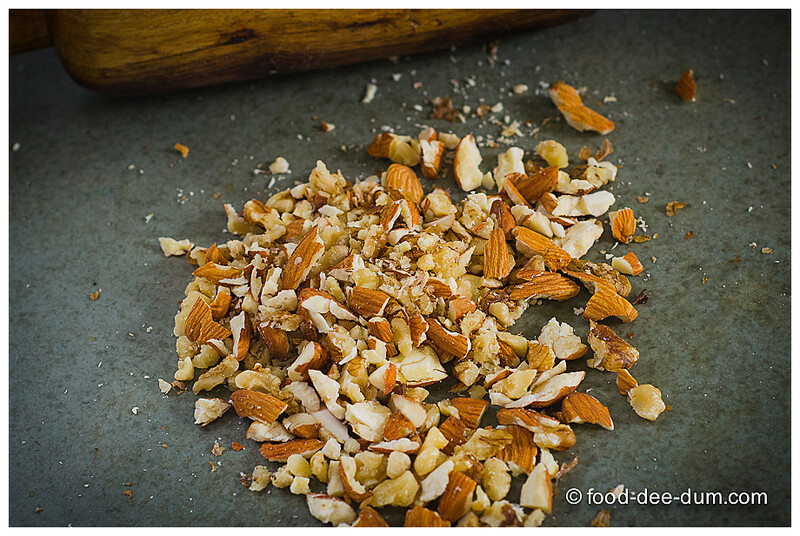 Then, I grated the carrots and coarsely crushed the nuts and kept them aside. Then I wistfully wished for some raisins because they really do kick this muffin up a notch. A moment later, I made my peace with their absence and moved on. I put the flours, the bran, baking powder, baking soda, cinnamon and salt in a bowl and whisked them to combine. In a separate bowl, I whisked the oil and egg together for a minute till creamy. Then I added in the vanilla, the jaggery syrup, the marmalade, Grand Marnier, the milk and mixed it all up. 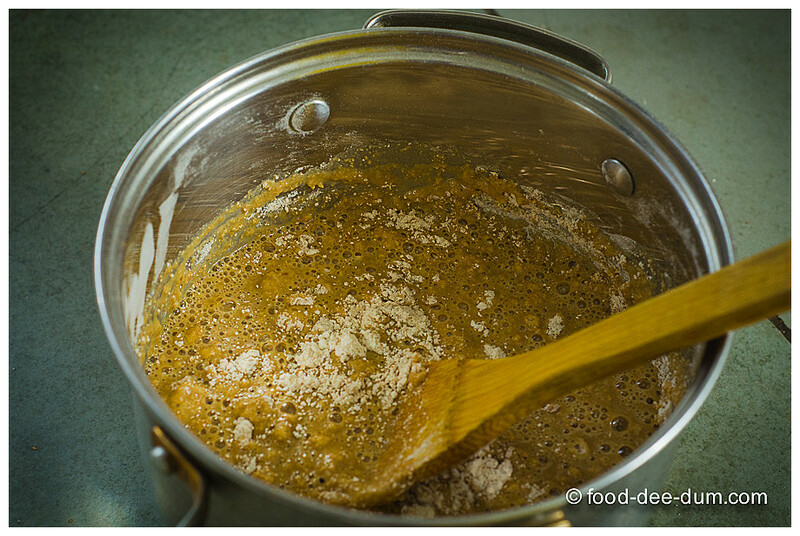 Then I added the wet ingredients into the dry and stirred to combine, ensuring that there were no lumps. 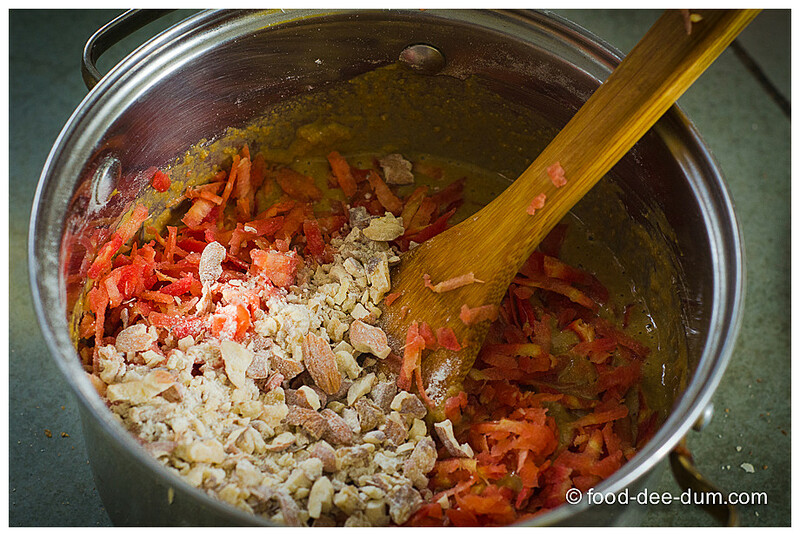 Lastly, I added the grated carrots and the crushed nuts and stirred them up. I like to toss and coat the nuts with a tsp or so of all purpose flour – it helps prevent them from sinking to the bottom while baking. I spooned them into the prepared muffin liners. I ended up with batter for almost 14 muffins so I overfilled the cups and made a quick pancake out of what was left because I didn’t have the patience to bake 2 muffins later, separately. My rule-of-thumb for batter and cake pans is that the batter should not exceed the 2/3rds-full mark if it is expected to rise. Things like brownies don’t rise much so you can break the rule in such cases. But I broke the rules anyway. Thankfully it wasn’t disastrous. My muffins just had a (ahem) “muffin-top”! I baked them for 15 mins at 180 C. Upon testing, the toothpick came out with a little batter so I reduced the heat to 150 C and gave them another 3-4 mins. 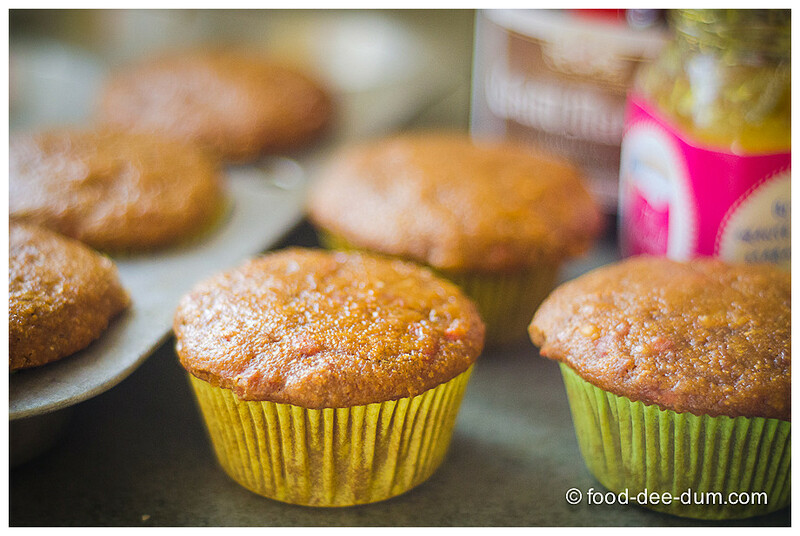 (When testing muffins/ cupcakes, I always insert the toothpick/ skewer/ knife in the middle muffins because they usually take the longest while the ones on the edges may cook a minute or so earlier). See. Serious muffin tops. Thankfully, having 1-2 of these a day need not give you one! I promptly bit into one before I finished taking all the photographs! PS: one of my readers wrote in to suggest that I put a quick summary at the end of each recipe, so that it’s easy to copy down. I’m going to do so, starting now. 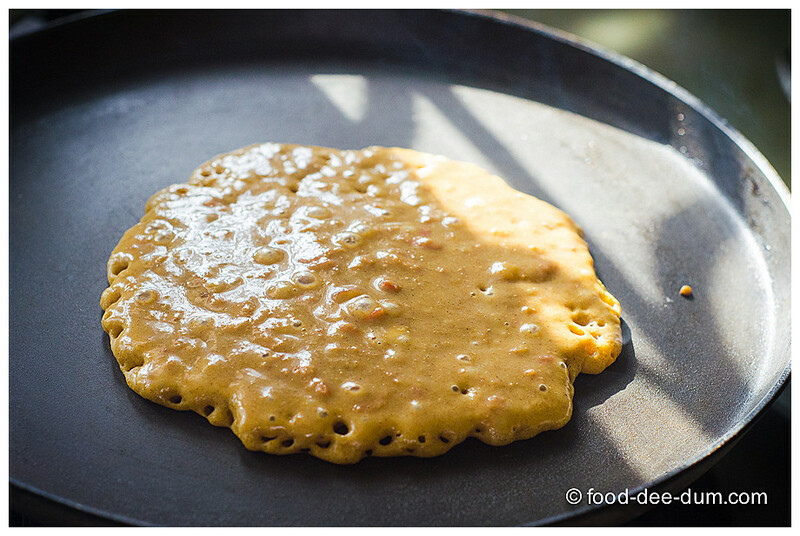 If there are any other suggestions that you have to make recipes easy to follow, do leave a comment here or write in to me at pk(at)food-dee-dum(dot)com. 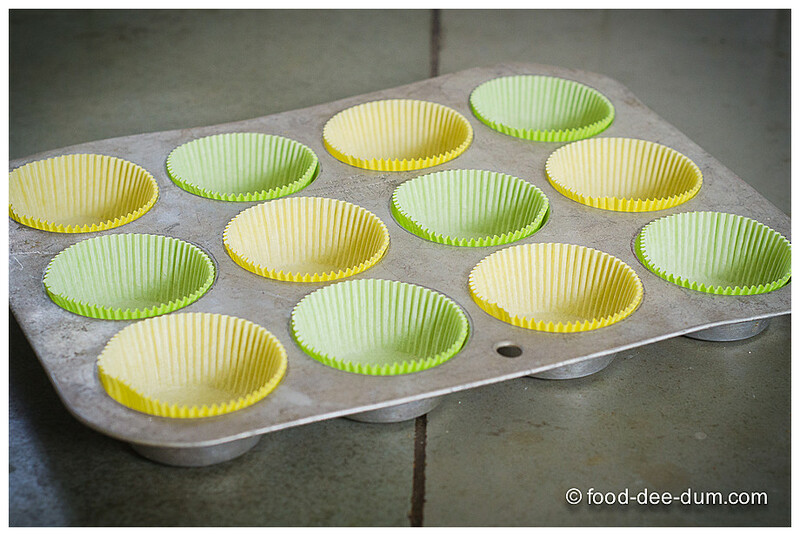 Pre-heat oven to 180 C and prepare muffin tray by placing liners and lightly greasing them with vegetable oil. Grate carrots and keep aside. Also coarsely crush/ chop the walnuts and keep aside. 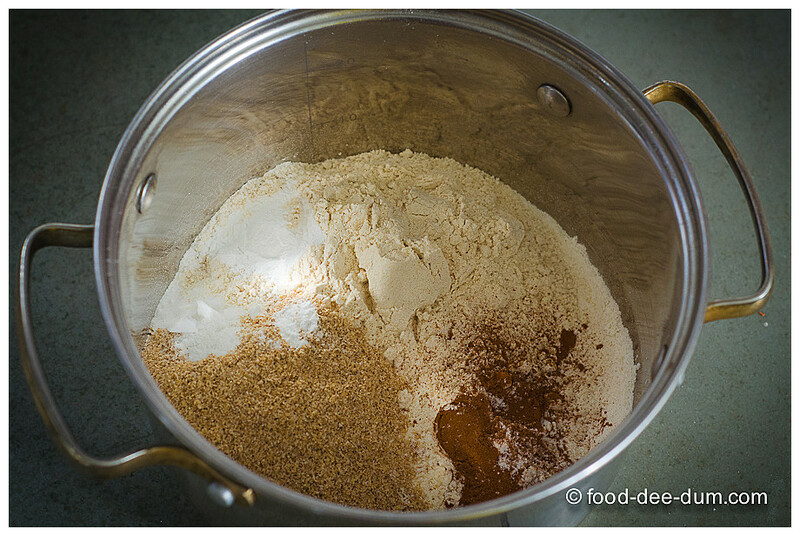 Place the flours, bran, baking powder, baking soda, cinnamon and salt in a bowl and whisk well to combine. 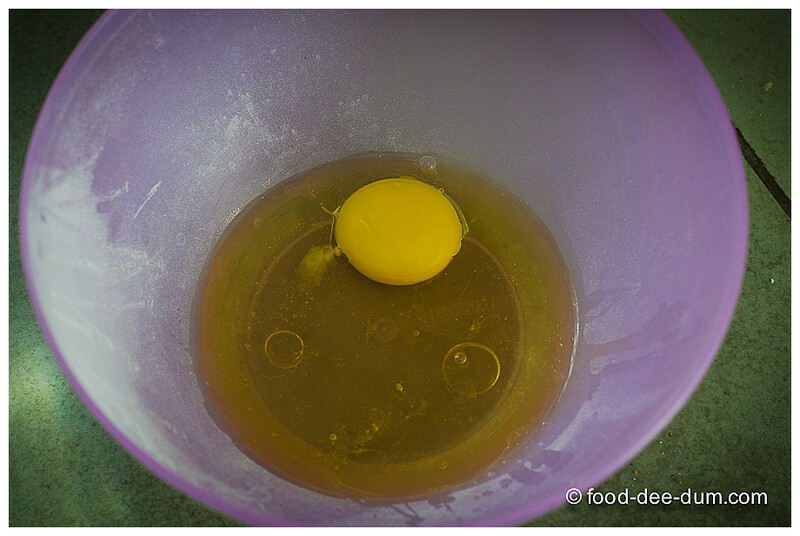 Beat egg and oil in a separate bowl for a minute till creamy and combined. 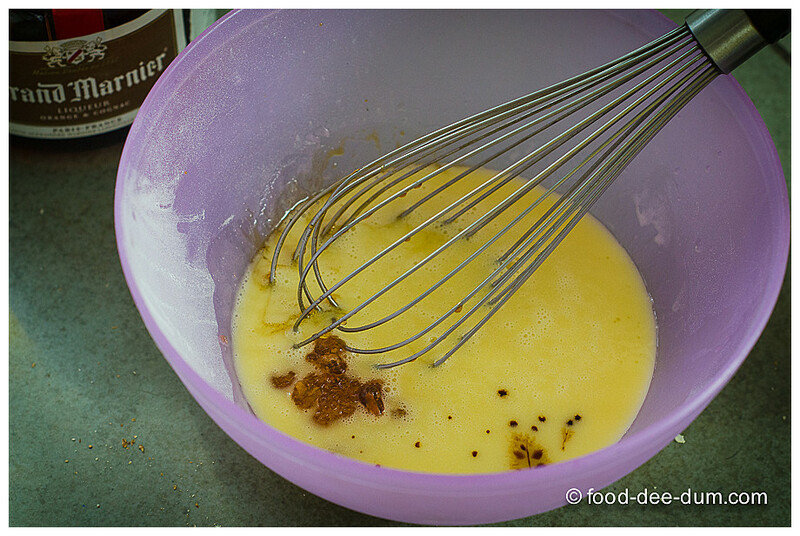 Add the vanilla, orange marmalade + Grand Marnier (or zest), jaggery syrup, milk and whisk to combine. Add the wet ingredients to the dry and stir to combine, ensuring that there are no lumps or flour streaks. Add the carrots, walnuts and raisins and stir to combine. 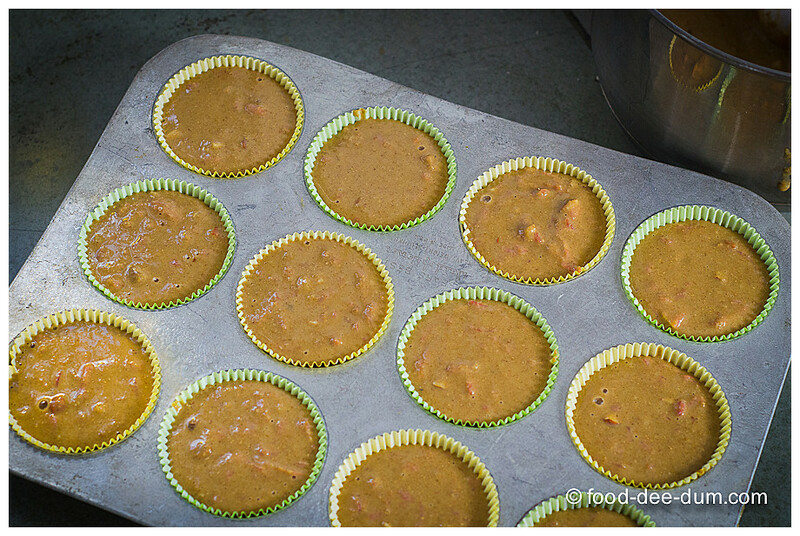 Spoon the batter in the prepared muffin cups and bake for 15 mins. Test with a toothpick. If not done yet, then lower the heat to 150 C and bake for another 3-4 mins. 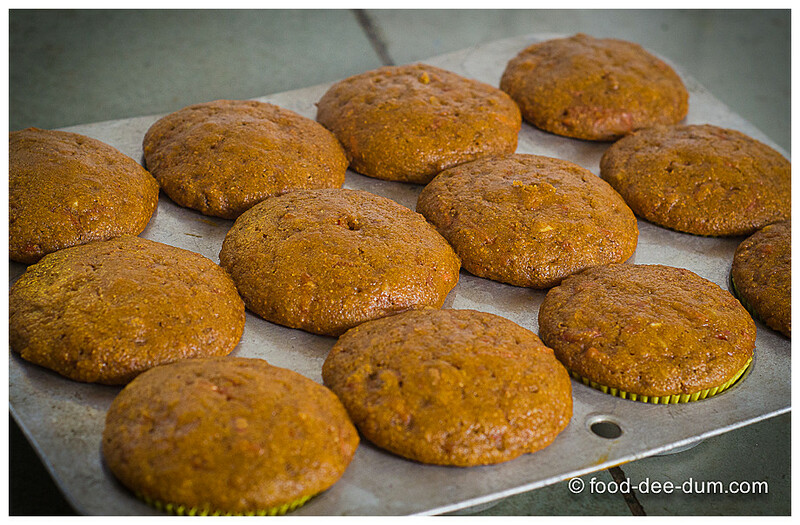 Remove from the oven and cool in the muffin tray for 15-20 minutes before lifting them out and serving. These store well in the fridge (in an airtight container) for 4-5 days. Note: the batter was enough for 14 muffins, but instead of baking in 2 batches, I overfilled the muffin cups (more than the recommended 2/3rds-full rule) and used up the remaining batter to make a large-ish pancake.